The model shows how well the wheel design works. Get up to date with part one and part two here before you get started here. It is finished. We first anticipated writing this short, triumphant sentence about six weeks ago, when we began to conceive, with the help of top-class UK designers and engineers, an all-new Volkswagen Golf-sized family hatchback for 2025 to 2030 and beyond. The car you see here, both as a 1:5-scale model and as a series of elaborate, almost photo-real digital drawings, is called the Share P42. It is our car for the future, a five-door C-segment hatchback proposed both for shared and private ownership by Autocar’s journalists, working with experts from the Coventry-based engineering services firm Envisage Group. Autocar’s angle? To investigate what a car planned for two to three generations’ time might be like, and to understand the problems and thought processes the world’s real-time car creators are facing right now. Envisage’s angle? 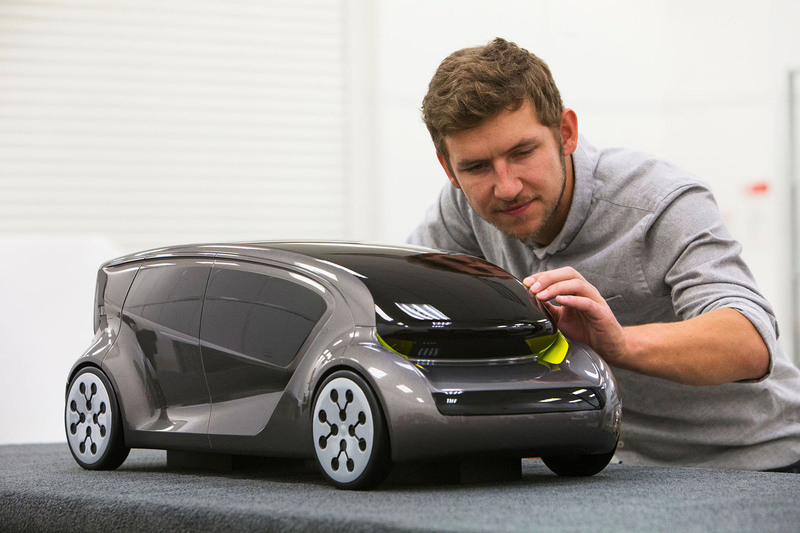 To publicise its impressive talents and skills in car design and prototype building as widely as possible – without revealing any of the confidential projects on which the business is based. The P42’s interior and exterior design is principally the work of four young Coventry Transport Design graduates (Aadil Hafiz, Michael Mills, Ben Martin and Danny Alvarez), who have worked for the past three months at Envisage’s 2016 summer school under the tutelage of Envisage’s practising designer, Oliver Le Grice. Engineering and feasibility work has been handled by ace software jockey Gary Skeggs, working under the creative leadership of Envisage’s dynamic engineering director, Bill Walsh. It has been an amazing experience. Here’s a confession, though: our car isn’t finished. In motor industry terms, it’s hardly started. True, it looks believable and complete, but we’ve learned enough about car creation over the past six weeks to understand that it would take three years from this point to resolve the many technical uncertainties, do the market research, carry out the detailed engineering design, find the suppliers and prepare the manufacturing operation that could put the Share P42 to 40,000-a-year production – assuming we could find a car company that liked the idea and had the finance. The Share P42 is a C-segment five-door hatchback, close in size and duty to today’s VW Golf and Ford Focus and as easy to use and own. 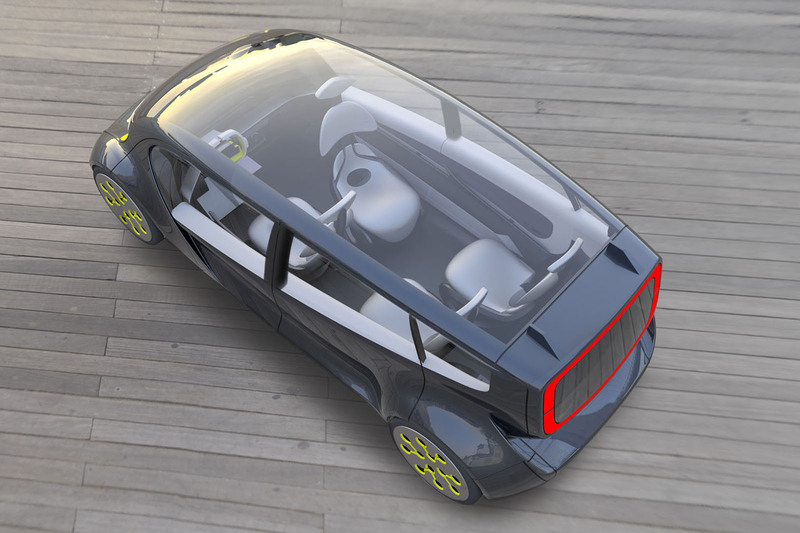 It can be configured as a shared car or a light commercial vehicle. It is a pure electric car of about 4.3m in length because, like much of the motor industry, we are content that new cars 10 to 15 years hence will prove that the future is electric – aided by the fact that battery prices are falling fast, batteries themselves are being packaged smaller and lighter, improving chemistry adds 5-10% a year and much faster charging points are on the horizon. Multiply all that by 10 and we’re in a promising place. 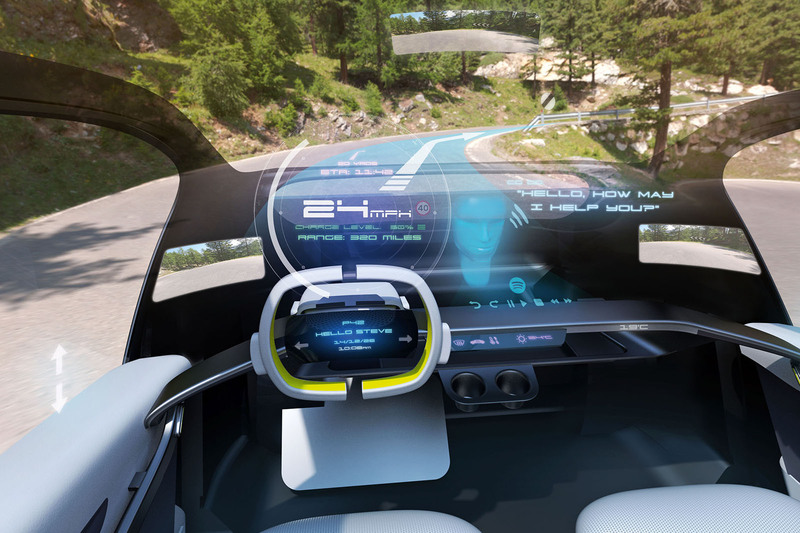 Our car is much sleeker and yet much roomier – in both passenger area and luggage space – because we’ve included two hugely important features that, we reckon, will be feasible by 2025-2030. The first is deployable front and side impact protection – in effect, compact external airbags that pop out to protect when a comprehensive package of sensors detects an impending accident. The second is the decision to design this car without a large, traditional fascia. Instead, we simplify its instruments with head-up displays, use the driver’s smartphone for personal settings and music, and give it a steering boss switchpad and a central touchscreen for primary and secondary controls. The airbags, comparatively small these days, are carried in the car’s pillars. The P42’s heating and ventilation gadgetry fits into engine bay space freed by its use of a single, compact electric drive motor, especially since much of its complex, currently bulky control mechanism will be carried in the cloud. As a result, much more of the car’s overall length is dedicated to passenger and load carrying. Or to put it another way, the P42 rivals a D-segment (Ford Mondeo-sized) car for passenger and luggage room, except that it’s 20-30cm shorter and 10-15cm narrower. It offers flexible seating for four or five, the possibility of more conventional seating for seven, plus a completely flat floor and a huge rear boot that presents the possibility of a cavernous (and possibly extended) white van version. One more revolutionary feature was the idea of a solitary light source, piped around the car by a series of mirrors and lenses to be used for headlights, tail-lights, signalling and interior lights – and perhaps even for messaging fellow road users. ‘After You’ displayed on a front screen might be a better message than a flash of the headlights. We’ve firmed up on the idea of a light, integrated spaceframe formed in aluminium towards the bottom and carbonfibre for the upper structure. We’re cautious about overuse of carbonfibre (CFRP, for carbonfibre-reinforced plastic, is Envisage’s more correct term) because it’s hard to recycle and recycling is about to be a bigger issue. The outer panels are made of seamless impact-resisting plastic, hopefully formed in one of the degradable compounds under serious development right now. The side doors are a clap-hands design, human-powered to save weight and complexity. They’re brilliant for access in tight parking spaces, and the fact that they don’t need a centre pillar makes for really spectacular access, especially with the seats in a club configuration. The load space will also be spectacular. Our designers have conceived a 600-litre volume accessible from the rear either via a side-opening glass door or a much larger lifting tailgate (containing the door), which reveals a flat, wide floor space. Instead of using what Le Grice dismisses as “ancient ironwork”, the P42’s seats have carbonfibre frames, which pick up runners integrated into the car’s aluminium floorpan, which also carries the thin, immensely strong and well-protected battery box. 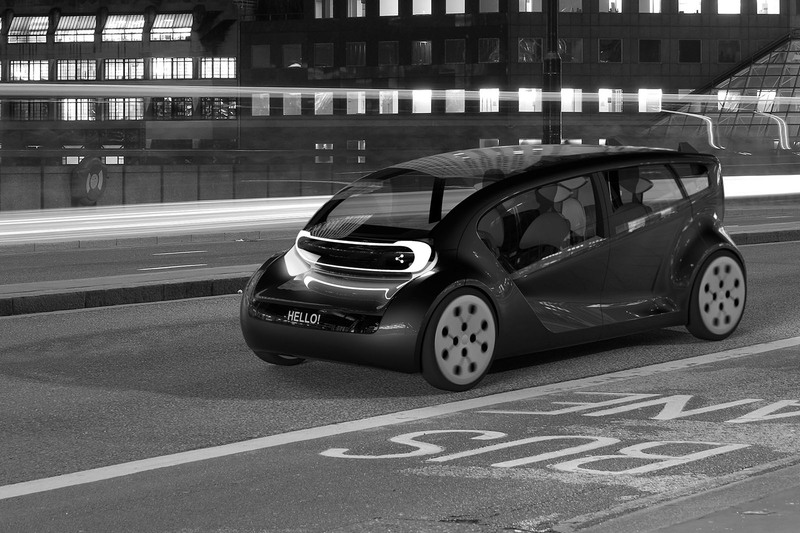 The P42 is proposed as a simple battery electric car, carrying the 100kWh energy pack that, Walsh believes, will be relatively common in the electric cars of 2025-2030. The battery is likely to have shrunk to two-thirds the size of packs today. In a car weighing 1600kg, with a drag factor of around 0.28 and a modest frontal area, it should be good for an honest range of 400 miles. Ultra-fast chargers, on the horizon now, will slash charging times so that this car’s pack should be able to be charged from near zero to 80% in an hour at the most. A get-you-home charge might take as little as five minutes. Performance? As befits a car that deploys maximum torque from standstill, the P42 will feel quick, but its 0-60mph time will probably be around 8.0sec, with a potential 100mph top speed governed to around 85mph both to save power and because regulations may well demand it. It will be smooth, seamless and almost silent power, though. Driving a manual gearbox, combustion machine from 2016 will seem like stepping back in time. By wire will be the way to go. There need be no mechanical connection between driver and motor, or steered wheels or brakes. New systems offer far greater flexibility of steering effort (probably configurable to the driver’s taste) and of integrated retardation between regenerative and friction braking, a current bugbear in hybrid and electric cars. It’s probable the P42’s driver will be offered a range of driving modes, selectable according to taste or loaded automatically via a smartphone app. Advancing NVH (noise, vibration, harshness) technology will do much more to help: flush glass will lower wind noise, fibrous panels will absorb sound, and ever more careful design of the exterior mirrors will cut wind rush – until these are replaced by much smaller rearward-facing cameras (the kind we have on our bootlids already). In short, very little noise should disturb your conversation or audio quality. The refinement theme offered by the P42’s near-silent powertrain will continue into the suspension and running gear: it has been configured with thin-section, low-noise tyres on 20in wheels. The all-independent suspension (double wishbones front, space-saving trailing arms rear) will have variable ride rates via magnetic dampers, whose settings are changed by both wheel movements and your sat-nav’s prior knowledge of the road. Sensing technology will sample your car’s grip in arduous conditions and configure the car, juggling its braking or limiting speed. Although it’s a low car, the P42 is uncommonly airy because its screen and windows are large, it has a see-through roof and there’s no bulky ‘furniture’ in its cabin. The seats are skeletal, compact and easy to move. The floor is flat. The doors are large. The steering column (which is likely to stay in place because we’re unsure whether full autonomy will be around – or permitted – when this car is on the road) can be made to fold forward, leaving the screen and switchgear in accessible positions. Of course, this car is always connected. It reads your preferences from a smartphone app. It communicates via the cloud with others of its ilk for safety’s sake. It monitors your health and tiredness by assessing your pupils. It predicts your likely journey and warns you of hold-ups. It responds to gestures and voice commands far better than today’s imperfect systems. And while doing all this, it is far more intuitive than today's systems. What is more, it is practically impervious to theft, at least as a private car, because it knows your unique fingerprints and the unique pattern of your pupils. And it is never truly ‘off’. If this Share P42 project has taught us one thing, it is that in the next decade or two, cars will be very, very different. This will be required by the authorities’ pursuit of lower and lower CO2 outputs and toxic emissions, which are not going away. Electrification – via batteries, hydrogen fuel cell stacks or petite on-board charging motors – is coming fast and we punters had better learn to appreciate its advantages. As Walsh puts it, “personal transport is about to become a hugely more relaxing, soothing experience,” even in a Focus/Golf-class car. With electrification, we hope, will come the kind of deployable safety systems suggested for the P42, leading to the changed proportions we suggest here. These, we believe, are arriving just in time. Many of today’s cars have become unfeasibly large and heavy, mostly because of the crash structures they must haul about. As a result, many of them struggle in supermarket car parks and along narrow city streets. Cars currently on the drawing board have many of the answers, especially if they can be shared by some as well as owned outright by others. We believe that many of their advantages are embodied in our dream car, the Autocar-Envisage Share P42. It’s just a shame that we can’t all fast-forward a decade or so to see if we are right. Finished? How about catching up on part one and part two here. Would anyone like to see my 9 year boy's prototype of a rubber band powered time travelling UFO? 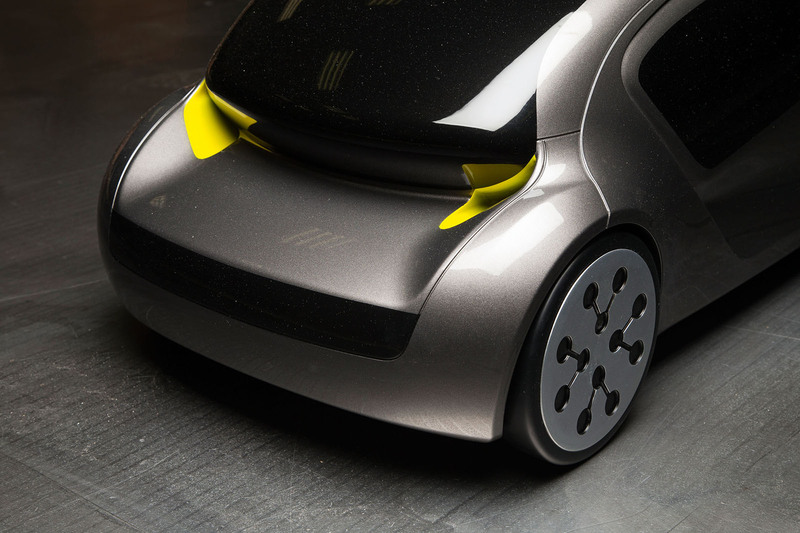 An interesting trio of articles however the biggest challenge for any peoples car is setting up the supply chain to manufacture 2,000 per day which involves far more parts, tooling, people and processes than building a one off prototype! I think he wants his car back. Unlike some others, who seem to have completely missed the point, I believe this has been a very interesting project. Unfortunately I think it will only be after major further tightening of emissions regulations that major manufacturers will attempt to build a market such a car as they are all too scared to do anything even slightly radical, in case it doesn't sell. I'm glad you're here to set us morons straight Bob. I don't get the use of huge 20 inch wheels? Surely the smaller the better for efficiency? I also don't like the idea of having drive by wire everything. What happens if there is an electrical malfunction? Once my BMW 3 series just completely died driving down the road. Literally everything turned off all at once. I could stop it and steer it to the side of the road because everything was mechanical. If this concept car did that you would have no control. At high speeds you could die. Which way round is it? I can't see the front. Did they forget to add one? Can someone tell me why it's left-hand drive? JLR didn't design it, did they?